We love Scala for its expressiveness, unique combination of functional and object-oriented programming, improved static typing. But we are also pragmatic who knows how far you want to push it so that you get its benefits without getting into its obscure parts. We have experience in virtually every area of Scala: the language, Scala.js, Akka, Spark, etc. We are building our product using Scala and can help you do the same. We have deep expertise in Spring Framework, Spring Boot, Spring Cloud and related projects having been a committer since their early days and worked with a diverse set of clients to make them successful with it. We can help you decide if and how Spring is right for your project, get you started with best practices, refactor existing projects to improve how you use Spring. We can particularly help you in defining or refining your product architecture. 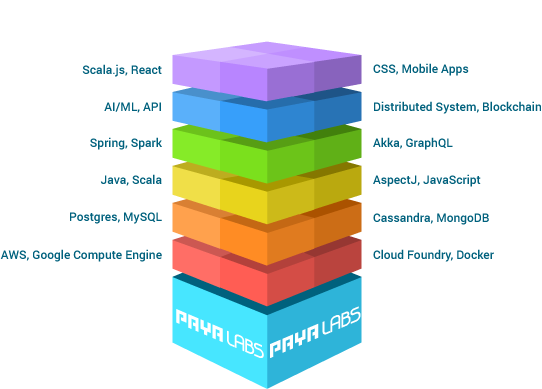 Having played an instrumental role in creating Cloud Foundry, we have been deeply involved in Cloud technologies ranging from Amazon Web Services, Google Cloud, and of course, Cloud Foundry. Our consultants hold patents related to Cloud Foundry and created Spring Cloud Connector. We deploy our own products using these technologies. We can help you design your own cloud deployment strategy and a migration strategy for your existing products. Everyone is excited about blockchain, but what’s the reality and how to leverage its potential and avoid its pitfalls. We can help you decide if blockchain is the right technology for you to pursue and how to approach to gain maximum benefits. A wide range of our expertise and experience enables us to offer deeper insights into the architectural aspects. We can help you choose the right architecture leveraging proven technologies as the base, incorporating cutting-edge technology in the right places, and avoiding the latest fads. We can also help you re-architect your existing system to implement new features with ease, respond to security and performance demands, as well as deal with nuances of your technology stack. Using latest technology will do only as good as developers using it. We can serve as an onsite and offsite mentor to make your developers more productive, help to get over troubling issues, tune performances, and so on.